This is a Ukiyo-e print of the Nihonbashi, likely to be of late Edo period or early Meiji Period. 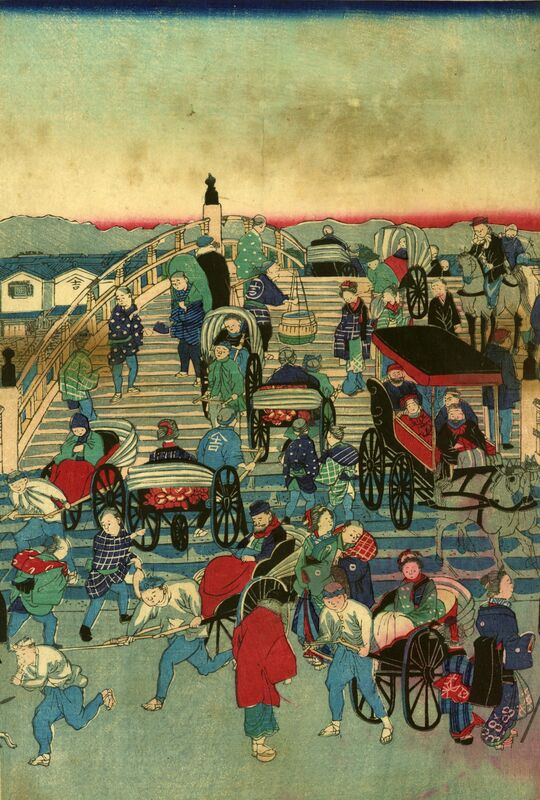 The print depicted a scene of the busy junction of the Nihobashi with Nakasendo and the Tokaido which connect Edo with Kyoto. There is much action going on in the scene. Since the Edo period, the Nihobashi area has been the commercial center and developed into the financial district of today’s Tokyo. The bridge in the print is the first bridge, a wooden bridge – Edobashi, it was replaced by a stone bridge, in 1964 an expressway was built over the bridge for the Olympic games. The print does not bear the name of the artist, it seems to have a similar style and theme of Utagawa Hiroshige III (perhaps someone more knowledgeable can let me know if my rough guess is correct).